But it became impractical to keep my piles of books and other writing materials on the bedroom floor. So this past winter, I ventured out to the dining room, a sunny room with an empty tabletop. And a big window that allows me to look out onto grass and trees and sky. 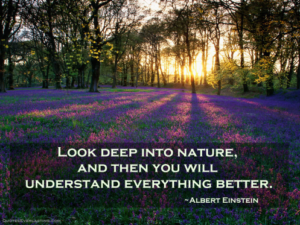 It has turned out to be the perfect spot, offering lovely surprises and unexpected lessons along the way. 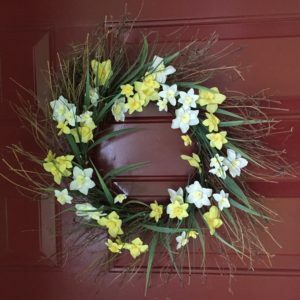 One blue-sky morning in late March, I was sitting at the table when I heard a gentle rattling at the front door. I looked up to see my cats, Wall-E and Howie, already sitting in the foyer and staring at the backside of the door. I glanced out the window and saw nothing unusual. I resumed work until the rattling and my cats returned. 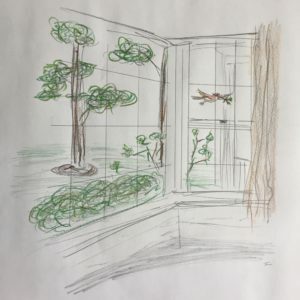 This cycle continued a few times until I noticed a small brown bird, carrying a leafy twig in its mouth, zip past the window toward the front door. It was the closest thing to a peace dove that I’d probably ever see, and the fleeting sight was magical. OH! 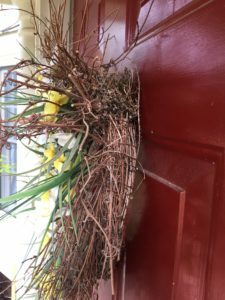 Could the bird be building a nest on the wreath? I hurried out the back door to take a look. When I was about 15 feet from the front door, the bird startled and flew away to the nearest tree, an oak tree in front of the dining room. The next time I heard the rattling, I peeked out the window. Yay! A nest in the making! 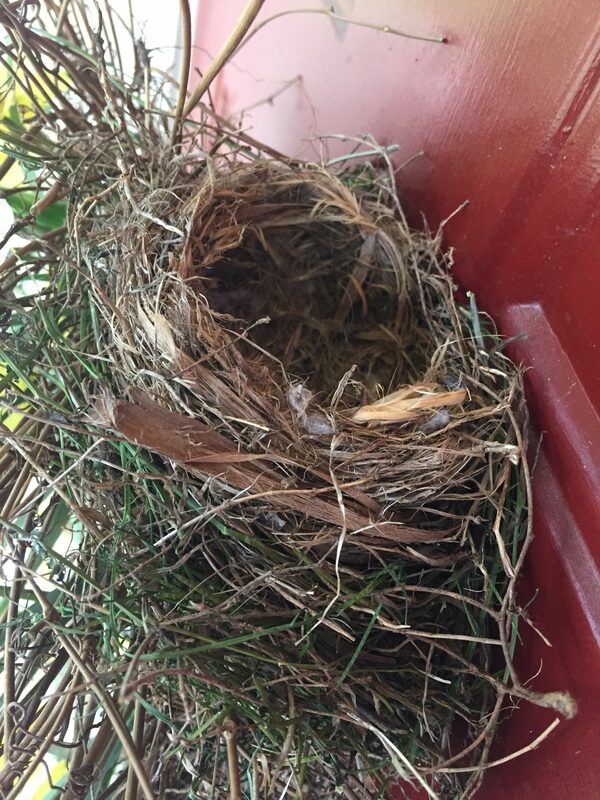 This city girl posted the breaking news on Facebook: Momma bird was building a nest! To lay eggs in! And there would be teeny tiny birdies! 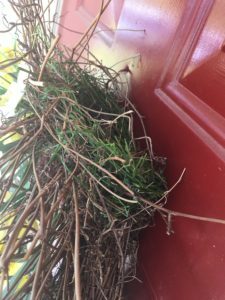 I was in awe of momma bird’s brilliant idea to build a nest on a wreath (camouflaged!) under the porch roof (protected! ); her expert skills in crafting such a beautiful and sturdy nest; her intense focus and abiding devotion. 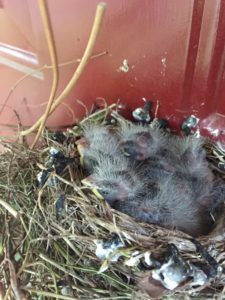 I was in awe of the miracle of life, with its newness and hope, unfolding at my front door. How did I live on 2 acres of land for 15 years and reach age 50 without witnessing this? And yet, how lucky I felt to still have so much of life to see. I went out of town to NYC for a writing conference. When I returned, I found five eggs! Perfect eggs. Gorgeous eggs. 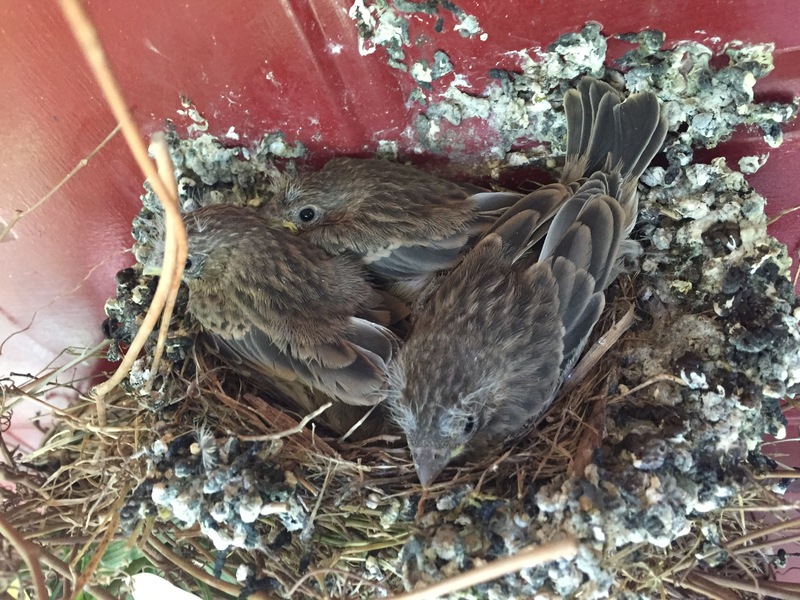 My husband Rob and I did research and determined that these were House Finches. 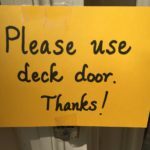 I asked visitors in advance to come to the back door. 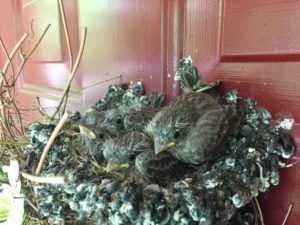 Whenever an unexpected visitor came to the front door, poor momma bird fled to the oak tree. No doubt she was worried about her eggs, but what else could she do? She had to take care of herself, too. And take good care she did — of herself and her eggs. Before long… Happy Birthday! The babies thrived. I could tell from all of the poop! 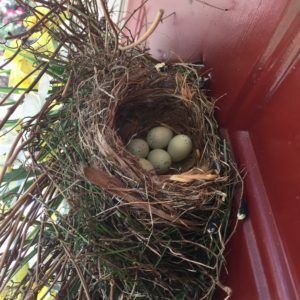 It was not a pleasant sight, but poop was part of the package (and seemed to act as an adhesive between the nest and the door). 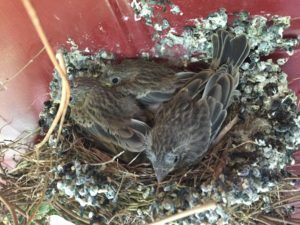 Be forewarned: as the birds grew, so did their poop! By early May, I noticed that momma bird had a companion in the oak tree. He was brown with red markings; poppa bird, I assumed! They chirped and flitted about in the branches, moving between the tree and the nest where they fussed over their babies. One morning momma and poppa birds were particularly chirpy and active. I heard what I thought was a mixture of excitement and nervousness. Could this be the day for their babies to take flight? It was — for one! 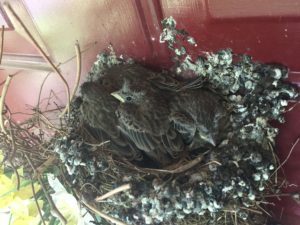 During the next two days, whenever I heard a flurry of activity, I checked the nest. 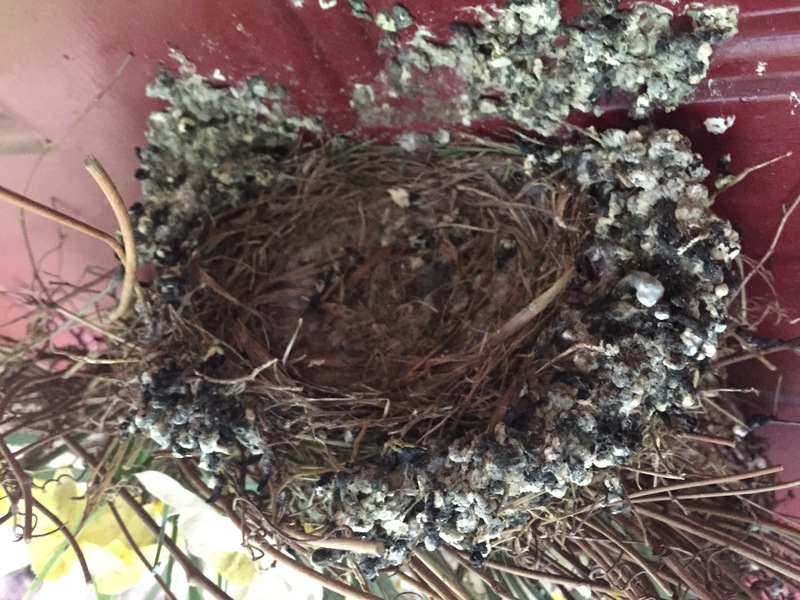 In the end, what remained was an empty nest and a whole lot of poop. And quiet. Momma and poppa birds had moved out of the oak tree. In the days following their departure, I missed the cheerful sounds and the sight of the sweet family. I was surprised by how much joy the entire process had brought to me. And equally surprised by how wistful I felt after the birds had left. But then, when something brings you joy, isn’t it natural to feel its absence? 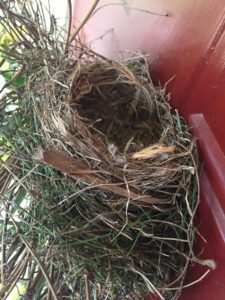 Yes, I was experiencing empty nest syndrome. Ah, I can always count on these two for a little levity! Still, why was I so moved by the birds? Other than allowing me to witness their amazing process, the birds also spoke to me as a writer and as a mom. 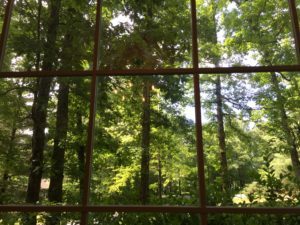 Building a writing career – building each story – is a process. And raising a child is a process. In the end, after doing the best we can, we send each manuscript and each child out into the world. We hope the world will be kind to them; we hope they’ll have good luck. And this is the case for whatever we invest our hearts into and then have the courage to let go of. I’m a writer who has just started the process of querying literary agents and sending them manuscripts. It’s exciting, and it’s hard. Realistically, I’ll receive many rejections, and they’ll sting. But as they roll in, I’ll continue to nurture my manuscripts before sending them out again… and again… and again. And, hopefully, one day an agent will think that one of them is ready. I’m a mom who has two kids wrapping up another school year: 9th grade and 5th grade. Part of me wishes I could keep them in those sweet elementary school years forever. But even if I could I wouldn’t, because moving on means that they’re privileged with life and growth. 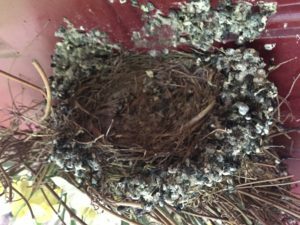 They’re still in my nest, but the reality is that they’re already leaving it on a daily basis, growing more independent; and one day they’ll leave for good when they’re ready. Take care of others (and yourself). Embrace the joyful moments and the process. Maybe the babies were afraid to fly, or maybe not. Maybe their parents were afraid to see them fly, or maybe not. Maybe the babies and their parents miss each other, or maybe not. Whatever the case, they all did what they needed to do. And that to me is beautiful: that they did what they needed to do. My family and I are back to using the front door. I’ve cleaned up the poop. But I’ll keep the wreath and nest up in case another momma bird (maybe even the same one or one of her grown babies) finds it and makes it home. It would be my privilege. My move from the old sofa to the dining room was practical. But it’s turned out to be instructive and inspiring, too. I’m glad that I’ve been able to look out the window to see new sights. In a way, the window has also served as a mirror, reflecting back those new sights into deeper insights. Some days I may still choose to sit on my comfy old sofa and write. But for the most part, I think I’ll stay put at the dining room table.